Sweat glands are present in CRAC channel–deficient patients with EDA-ID. 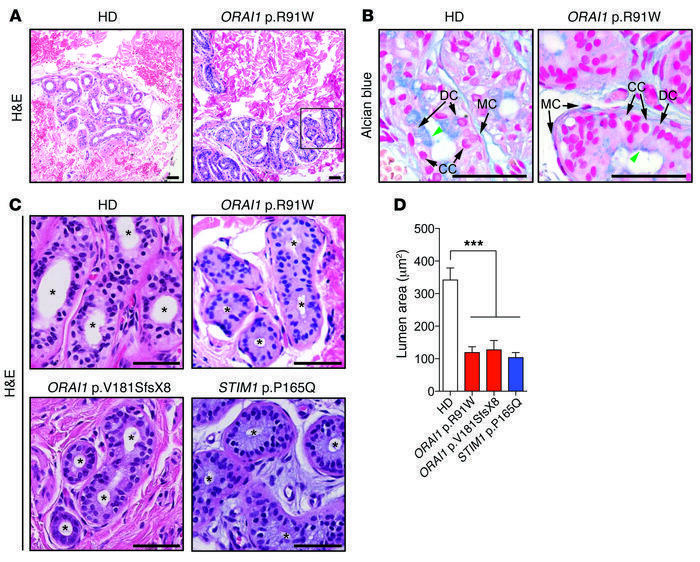 (A) H&E staining of eccrine sweat glands in the dermis of a healthy control donor (HD) and a patient with ORAI1 p.R91W loss-of-function mutation at low magnification. (B) Alcian blue staining of the same biopsies shown in A to detect acid mucopolysaccharides in dark cells (green arrowheads). Arrows indicate different cell types in the secretory portion of sweat glands (CC, clear cells; DC, dark cells; and MC, myoepithelial cells). (C) H&E staining of eccrine sweat glands in the dermis of an HD and patients with ORAI1 p.R91W (magnification of boxed area in A), ORAI1 p.V181SfsX8, and STIM1 p.P165Q mutations that abolish SOCE. Asterisks indicate the lumen of secretory sweat glands. Scale bars in A–C: 50 μm. (D) Quantification of sweat gland lumens from human skin biopsies shown in C. Bars represent the means of 3 HDs and 3 individual patients. Between 2 and 4 coiled nests of eccrine sweat glands were analyzed per skin biopsy. Statistical analyses were performed by 1-way ANOVA using HDs as a reference and multiple comparisons. ***P < 0.001.